If you recall, Samsung last month launched its two new budget smartphone the Galaxy M10 and Galaxy M20 in India with Infinity-V display. Now Samsung has officially announced the India launch date for the Galaxy M30 smartphone. 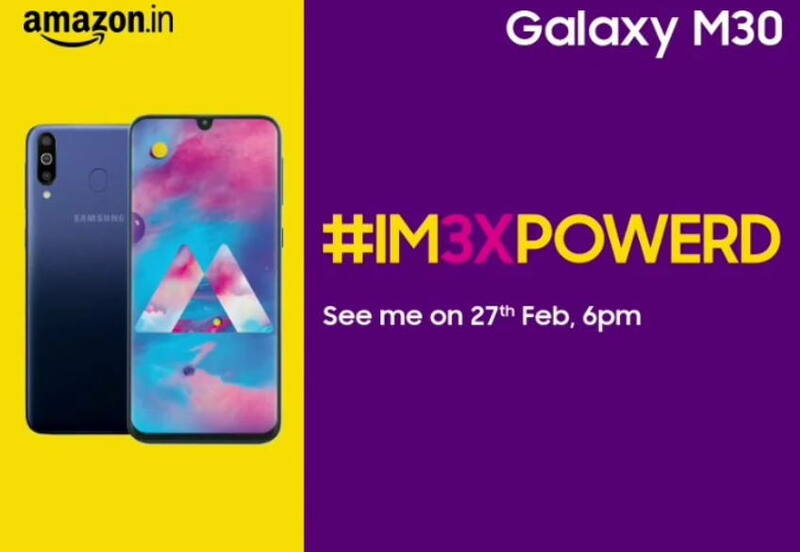 According to the official Samsung India Twitter account, Samsung will launch the Galaxy M30 in India on February 27th. Samsung Twitter post mentions the Galaxy M30 to come with “3X power” which refers and confirms that the Galaxy M30 will be equipped with triple rear camera setup. We can also see the triple rear camera set up on the shared image as well. The upcoming Galaxy M30 features a similar design to the Galaxy M20. The phone features a 6.38-inch Super AMOLED Infinity-V display with support for Full HD+ screen resolution (2220 x 1080 pixels). Now talking about the cameras, the Galaxy M30 will feature a 13-megapixel primary sensor and two 5-megapixel sensors along with an LED flash. On the front, it feature a 16-megapixel front-facing snapper along with support for face unlock feature.